Wow, just wow. Most expected a pretty straight forward roster announcement today by Bob Bradley but what came out was anything but expected. 1. Adu, really? Adu! Wow, this biggest shocker of all is Freddy Adu’s name being listed here. I know he’s done fairly well since moving to a second division team in Turkey but wow. No one and I mean no one saw this coming. That being said, I really do hope he uses all the negative press this will get to his advantage as motivation. I am willing to give the guy a shot here. 2. Shouldn’t be surprised by Bornstein. I know the guy hasn’t played much this year, well just 68 minutes since February, but he’s one of Bob’s guys. Let’s move on from that here, we all know he shouldn’t be here but there is little we can do to talk Bradley out of that now. 3. No Timothy Chandler? A bit of a shock, same could be said about Alejandro Bedoya too. 4. Wondo time! Some will certainly be shocked to see Chris Wondolowski over Teal Bunbury but let’s face it, this could very well be the move that delayed this announcement in the first place. Just my hunch really. Good for Wondo though as he’s really starting to heat up again here as of late. Bunbury on the other hand has been quite cooled in league play. 5. Rogers? Another shocker based on league play. He hasn’t looked good all season for that matter. 6. Bunbury’s no-call. I don’t mind the no call up for Bunbury here. 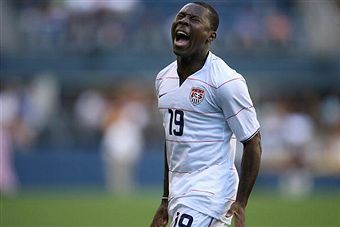 I’d imagine KC head coach Peter Vermes lobbied hard to keep him in a Sporting kit for the Gold Cup. His club is ravaged by the tournament with callups and between that injuries and lack of form for Bunbury at the moment it was the right thing to not call him up. Hopefully this is a case where he can use this as motivation to help turn the KC season around. What did you all make of this roster? Adu = Filling in for injured Holden (Could have also included Mix or Torres instead of Adu however) Wondolowski's Gold Cup (assuming he gets minutes) = Conor Casey's 2008-2009 WC Qualifiers. BB has always shown that any MLS striker playing well in the league will get his handful of caps to prove he belongs with the Nats. I wonder what Chandler is staying home for... Always been a BB fan but if Tim Chandler isnt injured and was frozen out fans and press will plotz. Bedoya....hard to say hes been playing well but doesnt fit into USA's current playing style and hes not playing well enough to displace Landon who has the USMNT role closest to Ale's at Orebro. That being said, he is certainly a better option than Robbie Rodgers. Good points on Adu. And you're right, its nice that Bradley does weight current form into the factor here with guys like Wondo. He probably won't do /that/ much in the GC but hey you to have a guy that has proven over the last year that he can score at any time. Wondo brings that element to the table. Sorry, Vermes mentioned last week that Craig Rocastle (Grenada), Stephane Auvray (Guadeloupe), Roger Espinoza (Honduras), Shavar Thomas (Jamaica) all should get call ups. Big losses for a club struggling right now.